160 W. Catalina Drive, Phoenix, AZ, U.S.A. 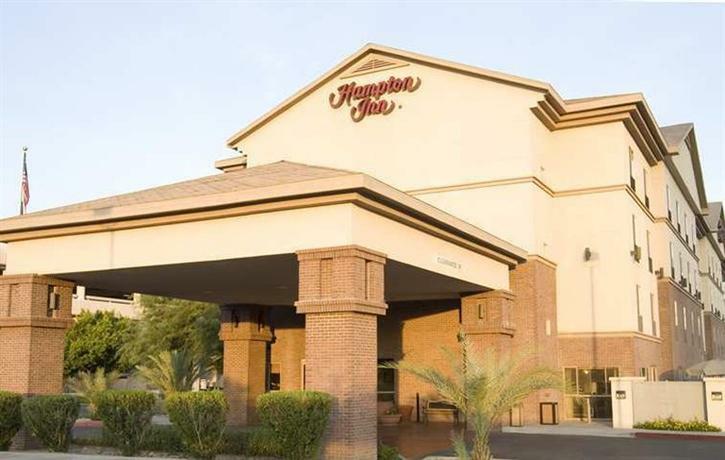 Located about a 10-minute drive from Phoenix's city centre and a 6-minute drive from Interstate 10, the Hampton Inn Phoenix - Midtown - Downtown Area is geared towards travellers who prefer a centrally located hotel with easy highway access, a free breakfast and an outdoor pool. This hotel has 99 air-conditioned guest rooms and suites, each offering free Wi-Fi, cable TV, a coffeemaker, a mini-fridge, a microwave, a desk, a lapdesk, an iron and ironing board and a hair dryer. Rooms with a jetted tub and a sitting area with a sofabed are also available, as are rooms with wheelchair accessibility. Hotel amenities include an outdoor pool, a hot tub, a fitness room, a business centre, meeting/conference space, guest laundry, a free continental breakfast and free parking. Breakfasts are also available to-go on weekdays, and pets are not permitted. Numerous guests were pleased with the hotel's location. They found it to be close to pubic transit, St. Joseph's Hospital, downtown Phoenix, shopping, the airport and museums. The hotel's staff were praised by many lodgers, who characterized them as helpful, knowledgeable and kind. One guest noted, "The staff was great from check-in to check-out... All questions asked were answered right away". Several reviewers enjoyed the hotel's accommodations. They described their rooms as clean, spacious, well equipped and nicely decorated, with comfortable beds and pillows. A few guests had complaints about their rooms, however (see below). The hotel's breakfast was also praised by several guests. They described it as fresh, yummy, delicious and frequently refreshed, with a good variety of hot and cold items, great service and a clean serving/eating area. A few guests complained of noise disturbances during their stay. They reported noise from guests in adjacent rooms, from helicopters flying to the hospital and noisy in-room air-conditioning units. While the majority of reviewers were pleased with their clean and well-equipped rooms, a few lodgers had complaints. They reported worn decor and intermittent/slow Wi-Fi signals. Expedia.com guest reviews rated the hotel 4.5 out of 5 with a 95% recommendation rate from 146 reviews. TripAdvisor.com guest reviews ranked the hotel #21 of 177 Phoenix hotels with an average rating of 4 out of 5 from 89 reviews. Booking.com guest reviews rated the hotel 8.3 out of 10 from 16 reviews. The author called the hotel on July 24, 2013 to verify some information. Rating: #2 out of 173 hotels in Phoenix ranked by guests. An oasis of comfort and convenience awaits you, here at our Hampton Inn® Phoenix-Midtown hotel. Our downtown Phoenix hotel is located next to St. Joseph's Hospital and Medical Center, and only minutes from the Phoenix Convention Center and the Arizona State Fairgrounds. The hotel is adjacent to the new Phoenix Light Rail System, so everything downtown Phoenix has to offer is just a quick, air-conditioned ride away. Take advantage of our warm desert climate to participate in outdoor activities like swimming, golfing, or exploring the nearby Camelback Mountains. Our downtown Phoenix hotel is also near United Health Care Group, IBM, as well as Qwest Communications. Whether you plan to visit our downtown Phoenix hotel for business or pleasure, you'll want to take time to explore our desert wonderland of activities and adventures. Our Midtown Phoenix Hampton Inn hotel is convenient to exciting sports and entertainment at Chase Field, U.S. Airways Center, and the Phoenix Convention Center. Other great Phoenix attractions like Veterans Memorial Coliseum, Phoenix International Raceway, and the Dodge Theatre are all just a quick drive away. If you need to work, you'll love our close proximity to Barrow Neurological Institute, Catholic Healthcare West, and many other medical and government offices. Though summer can bring the heat, the desert-dwelling team at our downtown Phoenix hotel knows how to keep you cool. And what could be prettier than those Camelback Mountains looming off in the distance? The friendly team at the Hampton Inn Phoenix - Midtown hotel invites you to relax and enjoy them with us.